We put some pictures of our Galapagos-Marquesas passage on Picasa. The new album can be found under this link. Enjoy! We're back in Hiva Oa now, after a beautiful four days on Fatu Hiva. On Monday (07MAY) we hiked to Omoa, the second village on Fatu Hiva, a bit south of Hanavave on the island's western shore. Over ~17km and five hours the hike took us up (and later down) approx. 900m. After four weeks on passage without much "weight bearing exercise" our legs expressed some surprise at the sudden surge in activity (see picture above...). Nevertheless, it was a beautiful walk across the island, with stunning views and fascinating changes in vegetation. 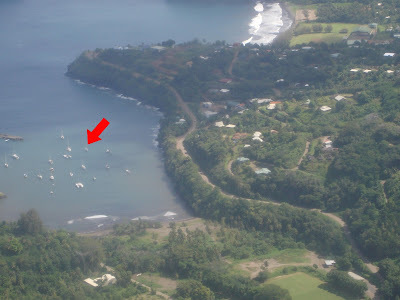 After having spent four days on Hiva Oa we came down to Fatu Hiva on Friday (04MAY). We left at daybreak and motorsailed most of the 44nm through the rain. It did clear up a bit during the last two hours and with the wind shifting as we got close to Fatu Hiva we got some nice sailing on a close reach at last. Forgot to mention in yesterday's post: We finally switched Namani's "ship's time" back another hour yesterday afternoon. We're now 9 hours "behind" utc. We checked the Nautical Almanac and it seems the only place we currently share this time zone with are Alaska's Aleutian Islands west of 169°30'W during the current daylight savings time there (the Aleutians east of 169°30'W are apparently in a different time zone, currently only 8 hours behind utc). So: Greetings from us to the Western Aleutians!